We use tools as a means of achieving our goals. When it comes to crafting content, there are endless blog tools at our disposal. Why use blog tools? Because they impact the outcome of your content. They can transform your well-crafted text into a stellar blog post that keeps users mesmerized. Here are some of our favorite blog tools that anyone can use. The Pagezii Blog Pulse Report gives you an overview of your blog’s performance compared to other blog’s in your industry. The report analyzes 40 posts per blog, going as far back as 90 days. This gives content marketers a “pulse” of their blog’s performance. To craft great content, you have to understand your blog, and the Blog Pulse report helps you do just that. By understanding your blog you can then begin to develop a winning strategy. And an air-tight strategy is what will set your content apart from the pack. Want to know how much people search for a keyword? The AdWords keyword planner will let you know. 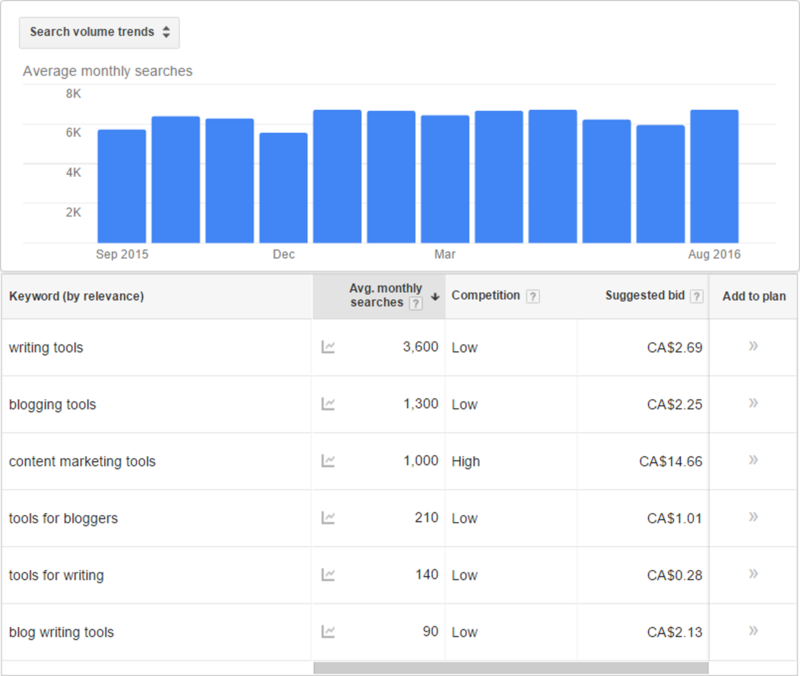 The keyword planner is great for initial keyword research before you begin writing a blog. Try different keyword variations for a topic you’re focusing on. This gives you insight into what users are actually searching for. Keywords with over +1,000 monthly searches is a good target to aim for. Anything less than that, and you may not receive all that much traffic for your hard work. The Hemingway App is one of our favorite blog tools. If you want to write clear and concise content, this app is for you. The Hemingway App highlights sections of content that take away from simple writing – e.g. adverb overuse and passive voice. It’s a great word processor for keeping your content simple. 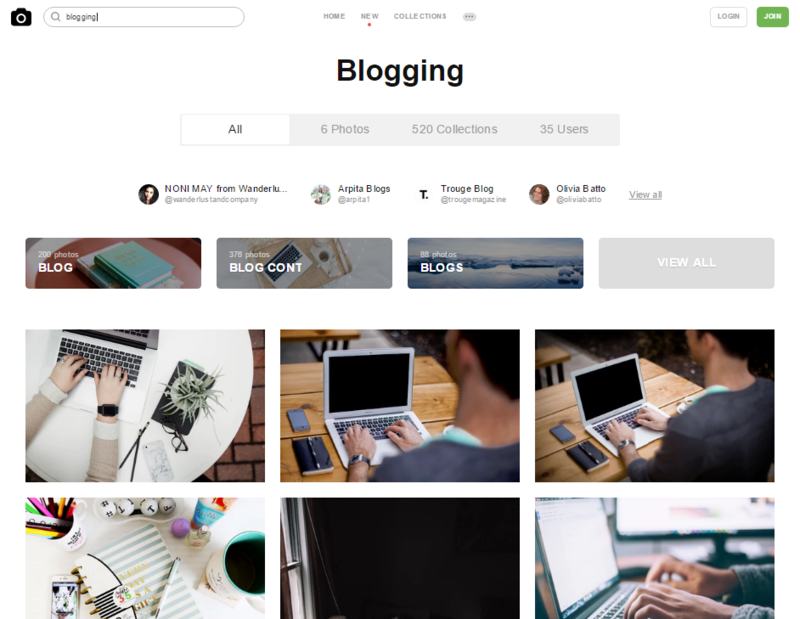 This post is about blog tools anyone can use. If your want to create rich content for your blog, PowerPoint is a quick solution. Images created in PowerPoint – e.g. a line graph, can help give your idea that extra kick through illustration. 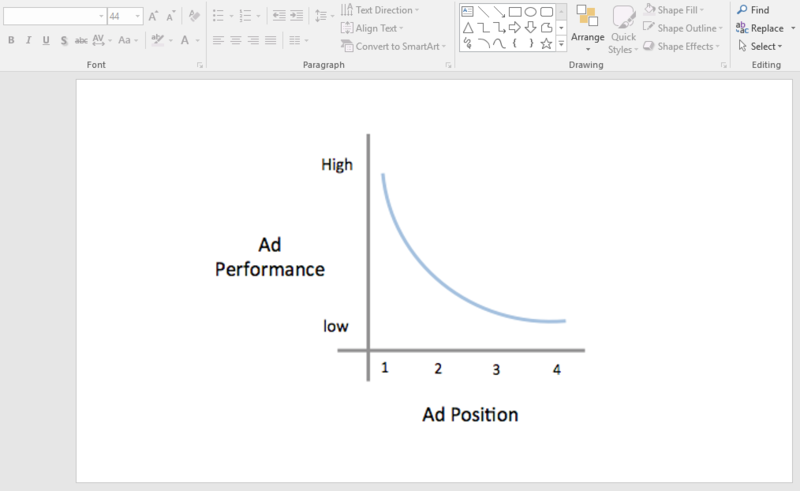 Here’s how I used power point to make a quick image comparing Google Search Ad Performance vs. Ad Position. This image took me all of ten minutes to create using PowerPoint. It’s not the sexiest graph ever created, but it illustrated the point and gave readers something to digest. Finished your blog draft? Pop it into Google docs and begin the editing phase. The beauty of Google docs is that it’s a cloud-based word processor. This means you and your editors can access the blog draft from anywhere and make edits. Editing is an overlooked process to great blogging. After you’ve written a piece of content, have others you work with review it. Collaboration makes your blog idea’s stronger, and helps you catch any spelling or grammar mistakes that take away from your blog’s credibility. You’ve published your blog. It’s getting traffic and you want to see how it’s performing. It’s time to take a look at Google Analytics Data. Google Analytics data will tell you how your blogs are performing once users land on the post. Pageviews – Total number of times my blog has been viewed. This tells me how popular my blog is. Unique Pageviews – The actual number of unique visitors my blog has received. Shows me my blog’s actual readership. Average Time-on-Page – How long readers stay on my post. Higher time spent on page indicates readers are engaged. Bounce Rate – The percentage of single page visits. Lower bounce rates mean users move on to other pages of my site from that blog. If you haven’t tested Grammarly’s chrome extension yet, you’re missing out. It’s like have a spell-checker anywhere you write. Making sure your grammar is point goes a long way for your company blog. Bad grammar is a recipe for visitors bouncing. 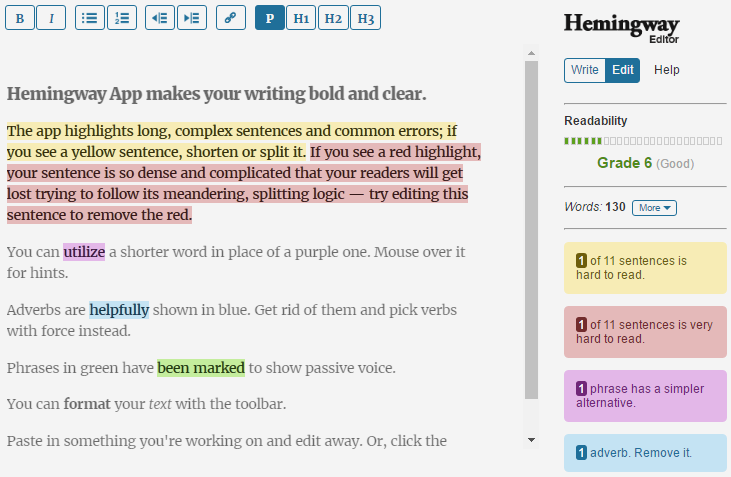 So make sure you’re writing your best with this awesome free tool. A blog tools list wouldn’t be complete without mentioned BuzzSumo. One quick glance at the site and you’ll see heavy hitters in the industry talking about its usefulness. 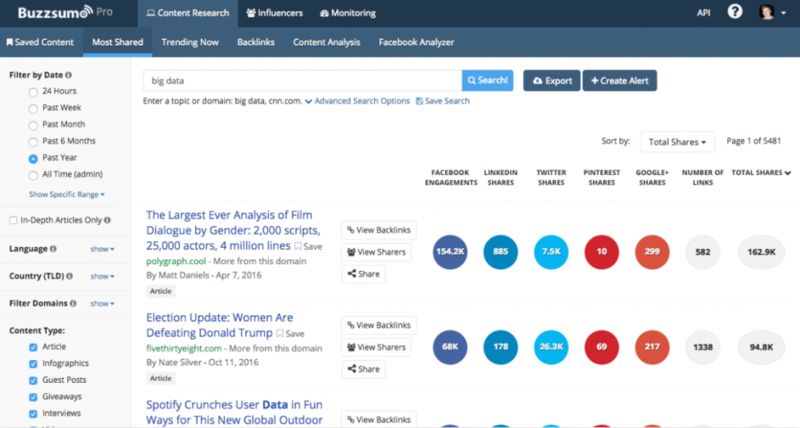 BuzzSumo is great for honing in on content that popular for specific topics. As a blogger, you want to focus on topics gaining traction in your industry. And BuzzSumo helps with just that. Make sure you’re discussing what’s important with BuzzSumo. this is going to bring in more quality readers to your content. Nothing spices up a blog like a nice graphic. We already talked about creating images with PowerPoint, but Canva takes things to the next level. 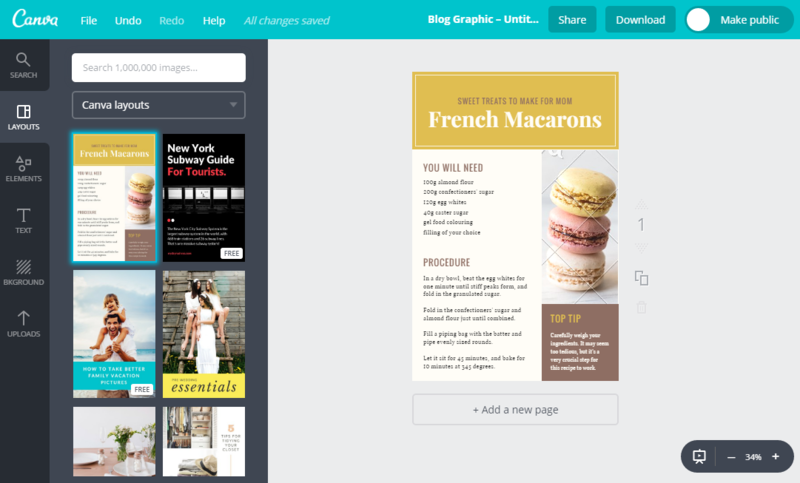 Canva is a web-based graphic design software that’s simple to use. Whetehr your a beginner or expert, Canva is a great tool. This blog tool is free to use and quick to get up and running. Help beautify your blogs with great graphics. Not a blog “tool” per se. But we’re huge fans of Unsplash, so we had to mention it. Unsplash isn’t your run of the mill free online photo site. These images are high-quality and easy to find throughout the site. To sweeten the deal, Unsplash also lets you do whatever you want with the images. You can add text, graphics or anything else you’d like to the images. Check out Unsplash today. Sometimes you need the perfect icon to spark your blog content. Enter the Noun Project. I love this tool because searching for icons is so easy. And most of the time you can find exactly what you’re looking for. Try it for yourself today. Using blog tools can transform your great piece of writing to a home-run blog post. Anyone can use the blog tools mentioned in this post, there’s no special expertise required. All you need is a desire to create great blogs.